Open and bright single level golf front townhome. Spacious design includes living room and dining room with skylights and walls of windows overlooking 3rd green of Midland CC. Den with fireplace and 1/2 bath perfect for occasional guest sleeping. Master bedroom has walk-in closet and bath plus extra room for exercise, office or hobby space. Guest bedroom with on-suite bath and large closet perfect for company. Kitchen has bay window eating area overlooking front courtyard garden. 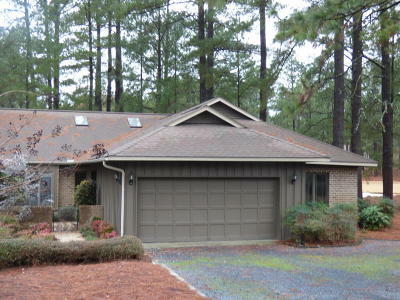 Brick exterior, 9' ceilings, oversize garage with storage cabinets and attic space.